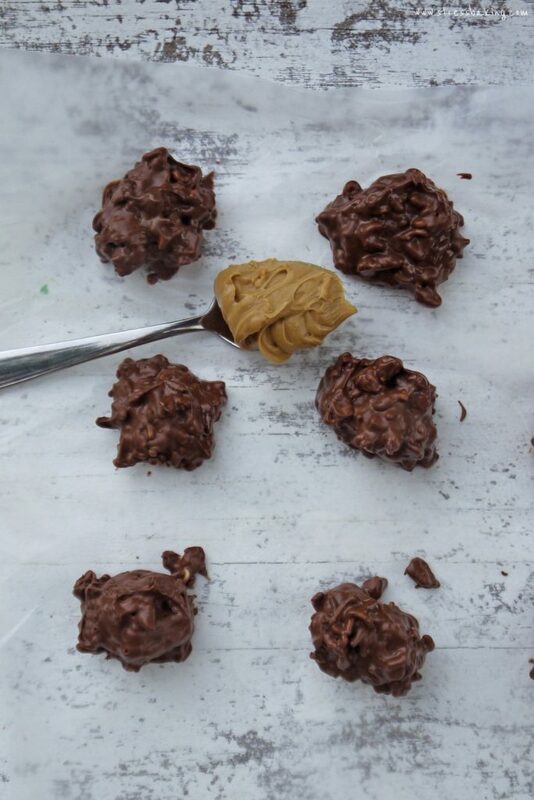 Three ingredients are all you need to make these creamy and crunchy treats: peanut butter, chocolate chips, and ramen! Did your parents ever make you buckeye balls growing up? I used to make them every time my extended family got together and I always had a hard time not eating the entire batch. I was always tempted to grab the tray and lock myself in my room and inhale all of them, snorting and grunting along the way. But I had enough foresight to know that I’d end up emerging from my room, covered in melted chocolate, groaning from an overfull belly. Now what about haystacks? Peanut butter, butterscotch, maybe some marshmallows, and those little chow mein noodles. 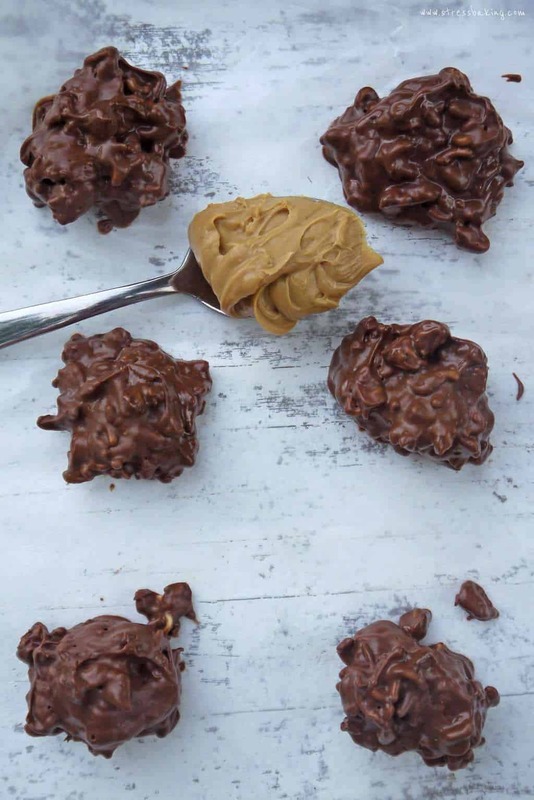 Little creamy, crunchy no-bake snacks with a similarly addictive nature. Well, I had a dream the other night about something from my childhood and I woke up practically drooling over the thought of both of these treats. So, at 4:30 in the morning I got up and started digging through my pantry. To my surprise (which is ridiculous because I live alone and do all the shopping) I didn’t have any chow mein noodles. But you know what I did have? And so, my latest in the ramen and funfetti challenge was born. You’re not even going to miss the chow mein noodles, I swear. And if you’re worried that it will be like biting into a rock, it’s not even close. 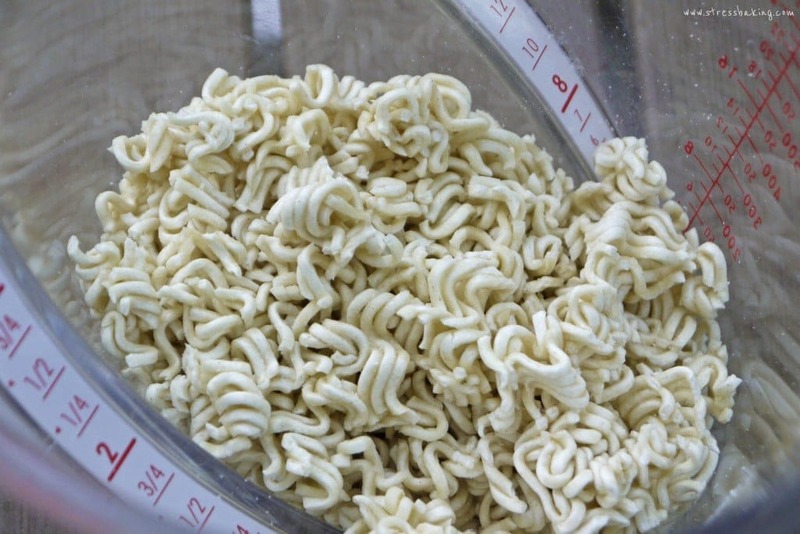 Think about how long it normally takes to cook ramen – three minutes. Since you’re adding the ramen to melted peanut butter and chocolate in a warm pan, it heats up juuuuuust enough. It’s the perfect amount of crunchy. Quite frankly, I don’t think I’m ever going to go back to chow mein noodles (!). There. I said it. 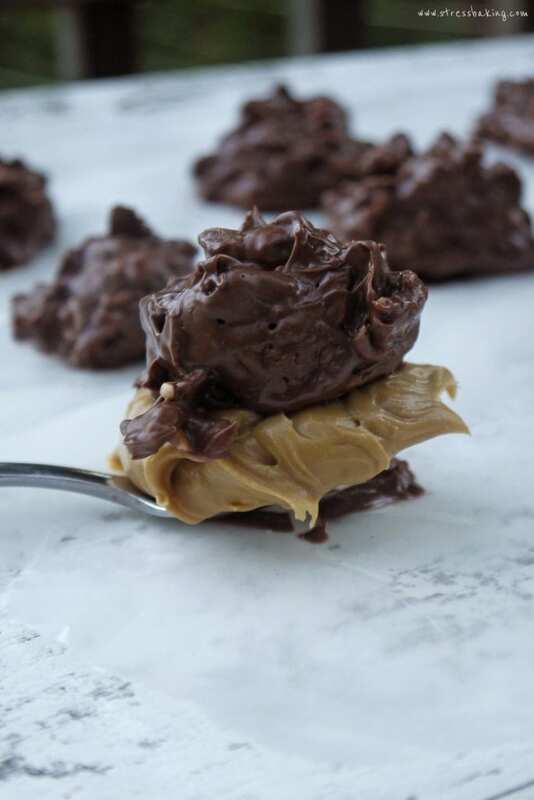 Three ingredients are all you need to make these creamy and crunchy no bake treats! Break ramen into smaller pieces and set aside. In a medium saucepan over low heat, combine peanut butter and chocolate and stir frequently until melted and smooth. Add ramen pieces and stir to combine and coat completely. Remove from heat and drop by rounded tablespoon (I use a small cookie scoop) onto prepared baking sheet. Place in fridge to set completely. Then enjoy!